Hartford Technologies is a world leader in ball bearing and assembly solutions. For more than 8 decades, Hartford has provided a cost-effective manufacturing solution for every ball bearing rolling element requirement. Hartford Technologies is IATF and ISO certified, ensuring the highest quality and manufacturing standards for their clients. Their expertise ranges from precision balls and bearing parts to precision pins and rollers. Hartford had an established track record of high visit to contact conversion rates. However, the issue was about the quality of leads coming in. The majority of contacts were of poor quality and not well qualified for sales. Snyder Group partnered with Hartford Technologies to not only increase traffic and contact submissions, but to also increase the quality of contacts coming in. The search algorithm used by Google is constantly being revised. Each update to the algorithm will change how Google treats search ranking contributors. In order to gain and maintain good search rankings, it is important to regularly perform on-page seo audits. This is the first step with any SEO client engagement Snyder Group enters int. For Hartford Technologies, the audit revealed the need for more specific long-tail keyword targeting. By optimizing URLs, Title Tags, Meta Descriptions, etc. towards keyphrases that included "Manufacturer" we were able to more narrowly target a B2B/commercial audience vs consumers. The SERP report targets and focuses on awareness of the brand. These potential customers are searching for a good or service but, not ready to convert just yet. One of the biggest problems manufacturing companies have when publishing content is understanding the role it plays in marketing and sales. 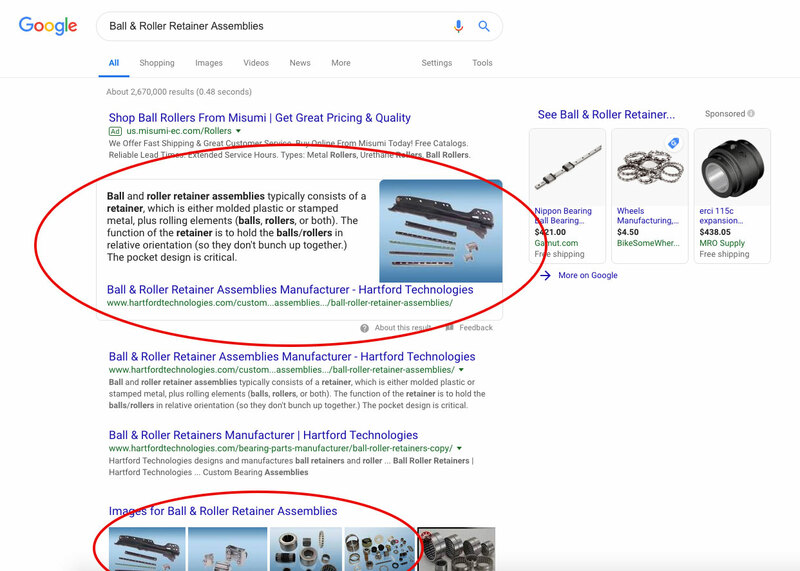 By establishing a clear buyer persona we were able to produce content for Hartford Technologies that their customers would naturally be searching for. One example was a post titled, "35 Lean Manufacturing Tools: The Ultimate List", targeting the Procurement buyer persona. Within a month this post became a top performer in terms of generating new organic traffic to the website. To date, it remains the number one source of traffic and the number one blog to this day. By proactively publishing new content that's valuable to Hartford's buyer personas, we are steadily growing the organic channel as the #1 source of quality traffic and contacts. Each month Snyder Group updates a proprietary Search Engine Ranking Report that monitors key performance indicators for SEO clients. This report includes a hitlist of target keywords identified by the client. 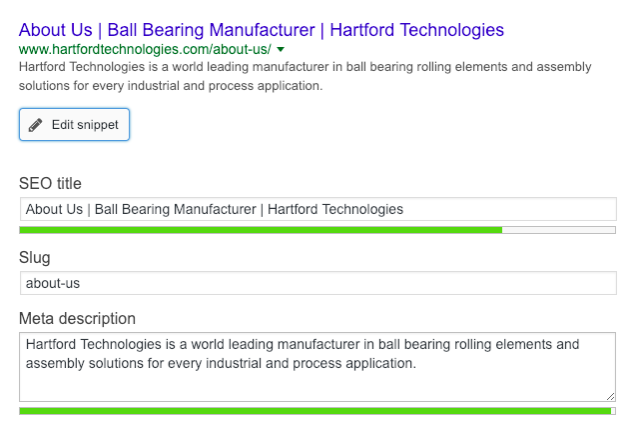 Through our combined efforts, we were able to get more than 50% of Hartford Technologies target keywords ranking on the first page of Google within one month. In the world of SEO, what could be better than a page 1, position 1 rank? The answer is a Google Authoritative Search Result. Below, the circled areas display an authoritative search result in addition to maintaining the top four photo results. Throughout our efforts of increasing our page rank and top-of-the-funnel content, we were able to see it translate to an increase of organic search to the website. Triple the organic traffic. THE BEST source of quality contacts and customers. HubSpot is an all-in-one inbound marketing and sales software platform that helps companies attract visitors, convert leads, and close customers. Snyder Group has been an official Hubspot Partner Agency since 2013. Learn more about Hubspot.